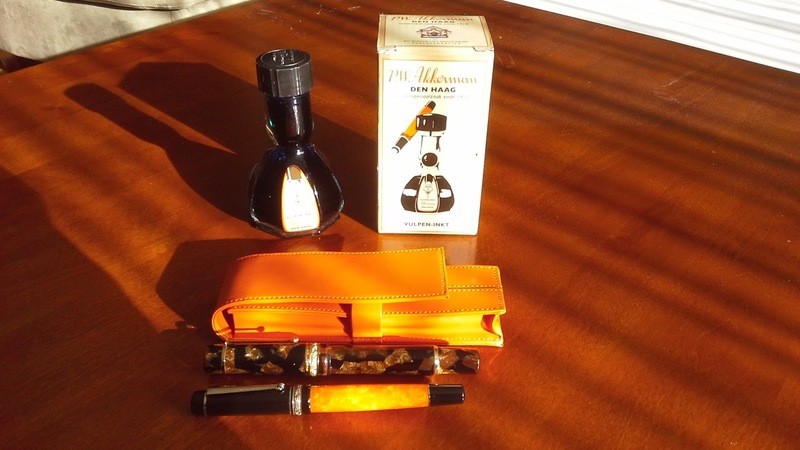 A couple of photos of some Akkerman ink I acquired from an online store in The Netherlands last November with the help of Ken C (thanks again, Ken!). The ink bottle has an elegantly simple system for trapping the ink in the upper part of the bottle, thus allowing for easier filling. 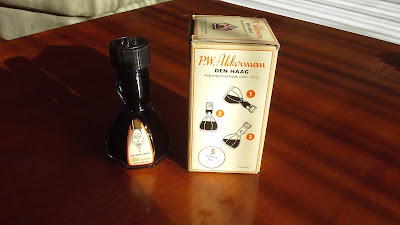 From their official website : "To mark our 100 years of existence, PW Akkerman introduced in 2010 his own ink line. This ink’s came in large 150 ml bottles, these large bottles are now completely sold out. Due to the worldwide success of this unique bottle we decided to continue, but now with a smaller sized bottle with a content of ca 60 ml. The new bottles will be available in the same 31 colors as before. The Akkerman inks have been given names related to the city The Hague." I reviewed these lovely fountain pens here and here.